Beer, fights and bad behavior: Are college football fans getting too rowdy? Tailgating with a few beers before a college football game is tradition, but security officials fear the drunken rowdiness among fans has reached new depths. Early in the 2017 season, several fights among fans broke out at college football games. Videos posted online show a scuffle at the Florida State-Alabama game, a fight during the Michigan-Florida game and punches were thrown in the stands at the Ole Miss-South Alabama Game. To find out the extent of the problem, KGW requested stadium security records from every major college football program. The records show at least 3,778 fans were ejected during the 2016 football season and 1,102 fans were arrested. Based on the records provided, the University of South Carolina had the highest fan ejection rate in the country, followed by Wisconsin, Oregon, Oregon State and Nebraska. That doesn’t necessarily mean those schools had the rowdiest fans. Comparisons are difficult because stadiums have varying policies on dealing with unruly fans. Not all colleges keep records on arrests or ejections. Of the 128 Football Bowl Subdivision programs that KGW requested data from, 122 responded but not all provided data. Sixty-eight provided arrest numbers and 66 provided ejection numbers. Most of the misconduct involved alcohol. “You couple alcohol with the upped emotions, the intensity, screaming and yelling and you have some potential for issues,” explained Brian Baxter, sports psychologist and director of the Sport Psychology Institute Northwest. At the University of Oregon, 139 of the 183 fan ejections last season were for alcohol violations. Across the country, stadium security kicked out thousands of college football fans for illegal consumption or public drunkenness. For example, during a Nov. 19, 2016 game at the University of Washington, police ejected one student after he was “found with cans of Bud Light in the stands.” Another fan had to leave after vomiting in the stadium. A 19-year old was found laying on the women’s restroom floor. She had defecated in her pants and was transported for detox. Fans were also ejected for other misconduct. Arizona State kicked out seven fans from a home game on Oct. 22, 2016. Reports show one fan was ejected because of assault. Another fan was booted because of a fight. One person had to leave because he grabbed a woman. Analysis of records provided by Pac-12 schools highlight some trends. Stadium security ejected the most fans during the first home game of the season, homecoming games and rivalry games. More fans were thrown out during evening games than afternoon kick-offs. “The earlier in the day, the fewer alcohol issues. 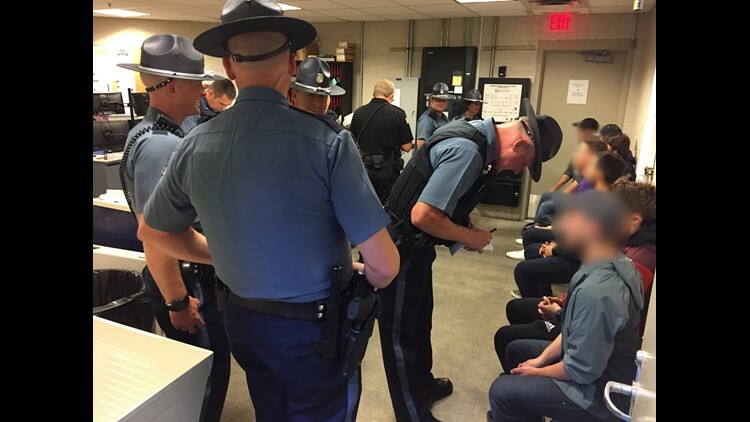 The later in the day, there’s a little more time to drink ahead of time,” said Lt. Eric Judah of Oregon State Police, who helps coordinate stadium security in Corvallis. Washington State Cougars vs. Arizona State Sun Devils Oct. 22, 2016Arizona State security cited and released 24 people for alcohol related offenses.&nbsp; One person was arrested for a fight.&nbsp; Seven fans were ejected. Eastern Washington Eagles vs. Washington State Cougars Sept. 3, 2016Security responded to 91 incidents during Washington State&rsquo;s home opener in Pullman, Wash. Nine people were ejected. Texas Longhorns vs. Cal Bears Sept. 17, 2016&nbsp;Five fans were ejected. One fan was arrested. College football stadiums are filled with students, but fights and drunken behavior can include fans well beyond graduation. Police records show a 73-year-old man was “excluded for over intoxication” at the Oregon-Oregon State Civil War game on Nov. 26, 2016. Of the 49 fans ejected from last year’s Civil War game, the average age was 26.6 years old. It is difficult to say which school has the most unruly fans because the responses from universities were so varied. Some schools said they didn’t collect arrest and ejection numbers, while others provided detailed records. For example, Washington State University shared full game-day summaries describing every incident, exact location and response time. During the 2016 Apple Cup game between the Cougars and Huskies, WSU police had an average response time of 3 minutes and 43 seconds at Martin Stadium in Pullman, Wash. In contrast, Eastern Michigan University provided a half-page summary. The Eagles had one arrest and two ejections during the 2016 season. Managing crowds at a college football game is a mammoth task. “We’re outnumbered,” said Sgt. Jeff Proulx of Oregon State Police as he looked at a crowd of 37,821 in Corvallis on Sept. 30, 2017. Thirty-eight OSP troopers worked security for the Beavers game against the University of Washington. That’s roughly one trooper for every 1,000 fans. “Section 112… over intoxication” crackled Sgt. Proulx’s radio. Sgt. Proulx hustled into the stands along with two other officers. They found a young student laying across the bleachers. She appeared to be drunk. “These are the fans that have either been drinking or drank too much -- what we call over-intoxication,” said Sgt. Proulx. Inside the exclusion room, intoxicated fans sat side-by-side on a long bench. Some of them laughed and joked with the officers. One man stared straight ahead- his face blank, eyes bloodshot. One student was crying. Police caught the young man with a flask of alcohol in the stadium. “We process them and get their information so we can have documentation,” said Sgt. Proulx. By the end of the OSU-UW game, police excluded 39 fans for alcohol-related issues. Typically, most fans are ejected without a fine or citation, police said. They’re simply asked to leave from a side door of the stadium. In addition to OSP, Oregon State Liquor Control staff, Corvallis police and campus security also help monitor the crowd inside and outside of the stadium. Whelan Security employs 500 people as ushers, bag check staff and parking attendants. The private security will notify OSP if an unruly fan needs to be removed. “It’s kind of like trying to run a mini-city for about four hours,” said OSP Lt. Eric Judah. Lt. Judah spent much of the Sept. 30 game perched in a command post high above the stadium, adjacent to the press box. He’s able to watch the crowd using an array of surveillance cameras with high-powered zoom lenses. “That helps us because we can actually walk troopers right up to a situation and say, ‘That’s the person!” explained Lt. Judah. Troopers say most unruly fans are apologetic and leave the stadium without creating any more problems, but there have been serious incidents. On Oct. 11, 2008, a fan at University of Oregon’s Autzen Stadium in Eugene had to be taken away on a stretcher after a fight. He and another fan had been scuffling over a seat, when the man fell over a railing. He toppled seven feet onto sideline and lost consciousness. In addition to alcohol, team pride can also lead to trouble in the stands. College football fans may feel greater anonymity when surrounded by thousands of like-minded people wearing the same color clothing. It is difficult to say whether fan behavior actually has gotten worse or if social media has simply amplified the problem. Online videos with several thousand views show football fans fighting in stadiums and throwing punches during pre-game tailgate parties. Data from the University of Utah shows ejection rates have actually declined since 2008. The university reported an average of 15.33 ejections per game last season, compared to 22 in 2008. Utah was the only school to voluntarily provide historical ejection rate data. For many fans, the drinking begins well before kick-off. Tailgating outside college football stadiums often includes copious amounts of beer, wine and liquor. During the Sept. 30 Oregon State game, fans outside of Reser Stadium in Corvallis partied under orange and black canopies set up in the parking lot, with big-screen TVs and music blaring. Tailgaters ate barbeque and drank out of plastic cups until just before kick-off, then returned at halftime for a few more drinks. “We run outside and pound beers. Then we run back in,” said one fan. In-stadium alcohol sales a solution? Alcohol is only sold at two locations inside of Reser Stadium, in the exclusive Club Level and the Terrace overlooking the north end zone. Both areas are cordoned off and require special ticketing. It is not clear how many schools allow the sale of alcohol inside college stadiums. The NCAA did not respond to KGW’s information request. The alcohol industry news site VinePair reported in 2015 that 34 college stadiums allowed the sale of alcohol. The number is reportedly growing. Last season, Ohio State University started selling beer and wine at home games. Ohio State officials said they actually experienced fewer problems with fans than in previous years. In 2016, Ohio State ejected 25 fans, down from 84 in 2015 and 104 in 2014. In most of the Ohio State stadium, fans are limited to two beers per ID. Fans can only buy one beer per ID near the student section. The policy is intended to prevent beers from being passed on to others, explained Penner. Last season, beer sales topped $1.1 million at Ohio State. Every few weeks, Ohio State said it receives calls from other schools seeking advice about selling alcohol during football games. West Virginia University started selling beer in the stands in 2011. The school doesn’t allow “pass outs,” which means fans cannot leave and re-enter Milan Puskar Stadium. This policy prevents fans from leaving the games to go out and drink more and then come back in. Security at West Virginia said game day incidents dropped dramatically after the changes. Many schools have also recently adopted new policies on bags in stadiums. Eight out of 12 schools in the Pac-12 conference have a clear-bag policy, which requires fans to use either a clear tote or plastic freezer bag. In 2018, the University of Utah plans to phase in the clear bag policy at Rice-Eccles Stadium. The new policies are primarily in response to security breaches around the world, but they also help prevent fans from sneaking booze into games. Some schools have banned bags altogether, including Ohio State starting in 2016. “We think that cut down on people smuggling drinks into the stadium,” said Penner, who notes there were only four alcohol citations at Ohio Stadium last year, compared to 65 in 2015. Stadium security officials admit there’s a balance. They want college football fans to have fun tailgating and cheering on their team, but not get too carried away. “We’re trying to create a safe environment for everyone,” said Sgt. Proulx before his police radio went off at the Beavers game. It was another over-intoxication report.